The economy systems are usually too complex to be analysed, but some advanced methods have been developed in order to do so, such as system dynamics modelling, multi-agent modelling, complex adaptive system modelling and qualitative modelling. In this paper, we considered a supply-chain (SC) system including several kinds of products. Using historic suppliers' demand data, we firstly applied the phase space analysis method and then used qualitative analysis to improve the complex system's performance. Quantitative methods can forecast the quantitative SC demands, but they cannot indicate the qualitative aspects of SC, so when we apply quantitative methods to a SC system we get only numerous data of demand. By contrast, qualitative methods can show the qualitative change and trend of the SC demand. We therefore used qualitative methods to improve the quantitative forecasting results. Comparing the quantitative only method and the combined method used in this paper, we found that the combined method is far more accurate. Not only is the inventory cost lower, but the forecasting accuracy is also better. Compared with traditional quantitative modelling, the qualitative modelling method lacks sufficient quantitative information, but can also provide the possible qualitative behaviours. In this paper, we apply qualitative phase space reconstruction of historic demand information. Tang et al.2 used phase space reconstruction and the description of qualitative behaviours of ordinary differential equations. In 1993, Lee and Kuipers3 developed and implemented a qualitative simulation-based method to construct phase space for a significant class of systems of two coupled first-order autonomous differential equations, even in the presence of incomplete, qualitative knowledge. In recent years, SCs have attracted broad interest from many fields, not only from many big manufacturing companies, such as Hewlett Packard (HP) and Procter & Gamble (P&G), but also from many academic research centres such as the Enterprise Integration Laboratory at the University of Toronto and the Intelligent Coordination and Logistics Laboratory of Carnegie Mellon University. The widely accepted definition of a SC is a set of approaches utilised to efficiently integrate suppliers, manufacturers, warehouses and stores, so that merchandise is produced in the right quantities and distributed to the right locations at the right time, in order to minimise the system-wide costs while satisfying service level requirements.4 We introduce a qualitative method to model a SC and then use qualitative phase space to analyse this SC based on the quantitative forecasting results by the maximum Lyapunov exponent method, in order to improve the SC performance. Besides the Lyapunov forecasting method used in this paper, many other methods have been applied to time series forecasting; artificial neural networks (ANN) is one such method. ANN can model both non-linear and linear structures of time series, with some studies showing that ANN can give better results than other methods.5 In addition, both theoretical and empirical findings in the literature reveal that combining different methods is more effective and efficient in improving the accuracy of time series forecasting than using a single method. Pai and Lin proposed a hybrid autoregressive integrated moving average (ARIMA) model and the support vector machines model.6 Aladag et al.7 proposed a new hybrid approach combining Elman's recurrent neural networks (ERNN) and ARIMA models. Others have introduced methods combining data mining to deal with time series forecasting; Bratko and Suc8 presented one approach to qualitative data mining, which aimed at finding qualitative patterns, or qualitative relationships, in numerical data. Zhuo et al.9 proposed a model of temporal pattern discovery from multiple time series based on temporal logic, which was applied to mining online frequent episodes and the change of patterns on mass event sequences. As to the time series forecasting research field, many quantitative methods have been introduced and applied to various fields. Here, we do not just give the quantitative forecasting results; the most important goal is to combine qualitative knowledge with the quantitative forecasting results. The main purpose of this paper is to find an easy way to control the inventory within the SC system and improve the SC performance. To do this, we firstly introduce the basic theory used, specifically the quantitative forecasting and qualitative algorithms. Secondly, we explain the basic assumptions for the model. Next, we present the market demand qualitative analysis based on the maximum Lyapunov exponent forecasting results. Lastly, we focus on the results of the analysis of demand and present a summary of the paper. In this section, we introduce qualitative simulation modelling. The qualitative simulation method derives from the qualitative simulation (QSIM) algorithm introduced by Kuipers in 1986.10 The simulation system consists of reasonable functions and a QSIM algorithm. The definition of qualitative reasoning was also given by Kuipers11: a method to describe the physical world by incomplete knowledge. All the variables in qualitative reasoning are expressed in magnitudes and directions. Furthermore, the SC system representation lacks quantitative information and the exact relationship of system variables to the physical system. However, qualitative reasoning can still describe all the possible relevant phenomena. Where f is continuous in [a,b], f is continuous and differentiable in (a,b), f has a limited number of singular points, limt↓a f '(t) and limt↓b f '(t) exist. The qualitative state, QS(f,t), is a two-tuples <qval,qdir> which denotes the qualitative state, QS, of the function f in time t, qval is a qualitative value and qdir is the trend of state change. The qualitative behaviour of f on the interval [a,b] consists of a series of qualitative states in which t1,t2,... represent the time points: QS(f,t0), QS(f,t0,t1), ..., QS(f,tn-1,tn), QS(f,tn). A qualitative differential equation model is an abstraction of an ordinary differential equation, consisting of a set of variables and differential constraints. Qualitative simulation starts with a qualitative differential equation (QDE) and a qualitative description of an initial state and stops with a graph of qualitative state descriptions. The concepts of QSIM representation here are taken from Forbus13 and Struss14. The QSIM algorithm reasons those physical systems as autonomous by qualitative differential equations. QSIM uses qualitative constraints to describe the system of QDEs, which can predict the possible behaviours of a system. However, not all of these predicted behaviours are correct because the conditions of some QDEs are not reasonable. In QSIM, the ordered landmark values can be asserted and can also be created while there is a new meaningful critical value found in the interval.18 Because the system states are continually changing, we may need some new landmarks to indicate the new QDEs. In this simple SC simulation model, we are mainly concerned with the variables which affect market demand. Using historic demand data, we can construct the qualitative phase space in two dimensions: the x-axis coordinate represents the time points and the y-axis coordinate represents the demand quantities. We selected about 450 historic time points with which to perform the data processing experiment. Though we consider the simple model as a SC management system, the main focus is the demand information processing among the supplier and the retailers, ignoring the other parts contained in the whole SC system, such as the raw material inventories, the in-process inventories, the product inventories, the raw material supplier, the manufacturing factories and the supermarkets. However, we assume the whole SC system performs well, that is all the products are delivered to the right place at the right time without any errors. 1. The price of raw materials from the supplier to the manufacturer could be changed according to the market situation, which would influence market demand. That is, when the price increases, the product price also increases and the market demand drops accordingly. 2. The shipments going through this whole SC system can be considered to be on schedule. 3. Customers purchase from the retailers and the retailers purchase from the supplier. In our simulation model we assume there is only one supplier that offers the products to the retailers, but there may be many suppliers. 4. The retailers sell goods to their customers and place new orders to the supplier according to their inventories and forecasting demand. 5. The supplier, when it receives the retailers' orders, ships out goods to them according to the inventory and the orders. As we assumed above, the goods shipment proceeds as scheduled, that is, all the goods from the suppliers to the retailers are delivered on time to the right place. As mentioned above, the retailers send demand orders to suppliers based on their forecasting results. Forecasting the quantity can be achieved by qualitative and quantitative forecasting methods. Our SC model contains a supplier and several retailers (Figure 1). In Figure 1 there are two kinds of information flows from the SC simulation system. The information flow and the product flow go through the whole SC; in our model the product flow from the supplier can meet the retailers' demands and the information flow from the retailers can be used by the supplier to forecast demand using qualitative and quantitative methods. Firstly, the supplier gets the raw material from the raw material supplier and manufactures the products; secondly, the retailers get the products from the supplier according to the orders and thirdly, the customers buy the products from the retailers. The most important part of this simple SC model is the middle part between the supplier and the retailers; the forecasting process also takes place in this section. We define this formula to indicate the function of the effects of these variables on market demand. Each factor has its own effect on market demand (QD), for example, when the product price P goes down, the market demand goes up. In this situation, QD has a simple relationship with product price P, that is QD = P(-); when the product's price P goes up, the market demand would decrease. QD also has a simple relationship with substitute goods' price PS, that is QD = PS(+); when the substitute goods' prices go up, the market demand would increase. In these two simple functions, '+' means QD has a qualitative proportional relationship with P and '-' means QD has an inverse relationship with PS. In this function, Q/D stands for the market demand while QD is achieved by the quantitative forecasting method as introduced above, and K means the influence of qualitative factors. The market demand forecasting combines quantitative and qualitative methods, adopting quantitative information and qualitative modelling, based on the improvement of reasoning ability in qualitative methods. In this way, this method can improve the accuracy of the physical description and reduce the uncertainty of the cost of the qualitative description. We analyse the additional quantitative information together with the qualitative description, which can not only make use of the prior knowledge to reduce uncertainty, but also can explain the quantitative observation system. The qualitative simulation model can describe the system behaviours, verify the system function and set system parameters, which is an effective means to system analysis. However, as to a more complex system, qualitative simulation may bring about the expansion of large solution space and the interpretation of system behaviour would become too difficult. In this case, the system will generate a number of states which are less likely to occur, owing to the introduction of quantitative knowledge; every step of the calculation resulting from the qualitative analysis can reduce ambiguity and also precisely define the system and its behaviours. There are two major areas in the combination of qualitative and quantitative analysis. Firstly, the expansion of qualitative description through quantitative knowledge, reflected in the expansion of landmarks, phase space definition and transmission of quantitative information; secondly, the integration of quantitative and qualitative simulation. Shared variables have a dual description of qualitative and quantitative, which is both specific and quantitative, with the qualitative value using the QSIM algorithm and a depth-first expansion tree. A QSIM first layer has a new expansion; there is a quantitative model as a filter to remove the layer with the simulation of expansion to an inconsistent state. The layer in the new expansion of the right branch is shared variables. Shared variables are used to determine the qualitative expansion from which it is possible to estimate the behaviour branch at the same time but is less inconsistent. In order to make accurate market demand forecasting, we first use the maximum Lyapunov exponent forecasting method to carry out quantitative forecasting about product demand according to the historic information. We selected 470 days of demand information, which is the information given to the suppliers by the retailers. Each time point in Figure 2 represents one demand data for each day and we made a demand forecast based on the last 20 days, which was then used to compare the real demand quantity and the forecasted demand quantity (Figure 3). However, the former real demand quantity and the forecasted data differ greatly. 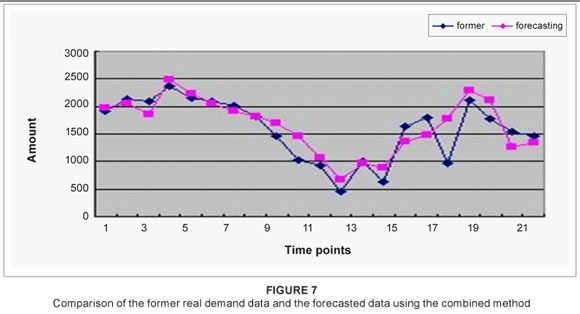 In addition, the forecasted results do not match the pattern of the former real demand data  from time point 5 to 13, the demand amount decreases daily, but the forecasted data do not reflect this distinct pattern. So we now apply a qualitative method to these forecasted results. As we have shown above, the market demand depends on many factors. If any one factor changes, the market demand QD varies. According to [Eqn 2], QD has complex relationships with these factors. Furthermore we can describe these relationships as follows: QD = P(-); QD = PS(+); QD = Y(+); QD = A(+); QD = N(+) and QD = T(-). 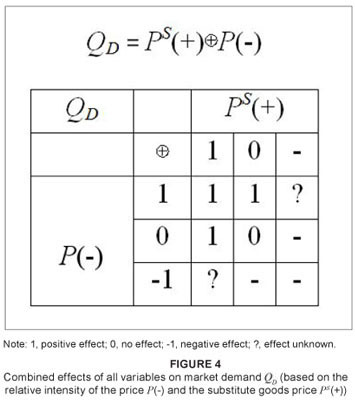 Figure 4 illustrates an example of the joint effect of these factors. When the qdir of P(-) equals 0, then P(-) has no effect on QD. When the qdir of P(-) equals 1, then P(-) has a positive effect on QD and when the qdir of P(-) equals -1, then the effect is negative. The combined effect of PS(+) and P(-) on QD and ⊕ is a special kind of operation. In Figure 4 the sign '?' means it is not clear what the effect is on QD. This uncertainty makes it difficult to forecast the product market demand, so, in this situation we can set some qualitative and quantitative constraints and the relative intensity to these factors. For example, if the relative intensity of P(-) is stronger than that of PS(+), then QD = PS(+)⊕P(-). If P(-) = -1 and PS(+) = 1, then the result is -1. In the same way, when P(-) = 1 and PS(+) = -1, the result is 1. Of course, we can also set the relative intensity of P(-) to be weaker than that of PS(+) and the results would then be different. With respect to qualitative phase space construction, first the definition of a landmark should be introduced. Lee and Kuipers16 have already developed and implemented a method to construct phase portraits. 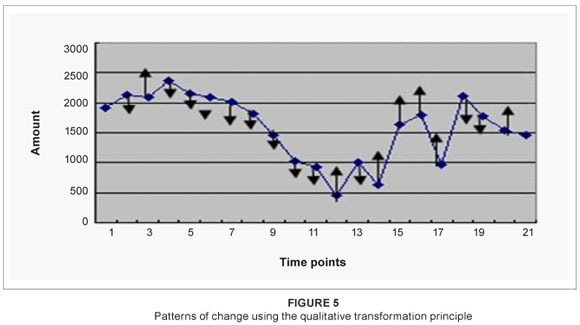 According to the general state transformation principles we can get the qualitative phase space as shown in Figure 5. For instance, for time point 9, considering that time point 7 and time point 8 are decreasing, and according to the qualitative transformation principle P6--<(lj, lj+1) dec>→(lj, lj+1), dec> and principle I7--<(lj, lj+1) dec>→(lj, lj+1), dec>, one can conclude that time point 9 also is decreasing, as shown in Figure 5. Here, (lj, lj+1) means two qualitative state transformations between two time points and dec means decrease. In other words, the qualitative state transformation trend is to decrease. The qualitative phase space of the SC time series is shown in Figure 6: according to the Liangyue Cao algorithm, we calculate the embedded dimension as 3. After some qualitative processing, the qualitative phase space represents the SC system behaviour trajectory. From Figure 4 we can make further qualitative forecasting based on quantitative forecasting results. 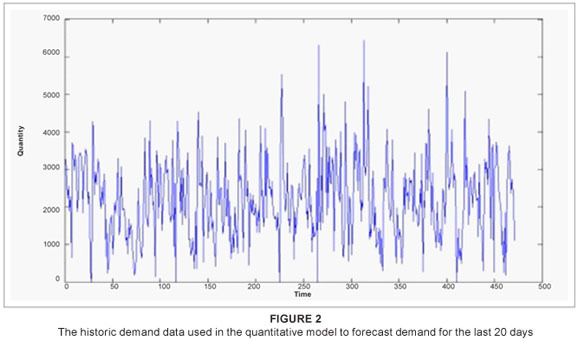 Figure 3 shows that, according to the quantitative forecasting method, we can forecast the demand quantity; however, the result is not accurate, which is why we apply the qualitative forecasting method to improve the quantitative forecasting results. In this SC system, if the supplier offers another newly produced similar product, then P(-) will be lower than before (to ensure that there are buyers of the former product), and the product demand quantity will vary. From Figure 4, we can see that the market demand QD will increase because of the product price change, or we may say that P(-) is 1, no matter what the value of PS(+), QD = PS(+)⊕P(-) = 1. The result is illustrated in Figure 7. 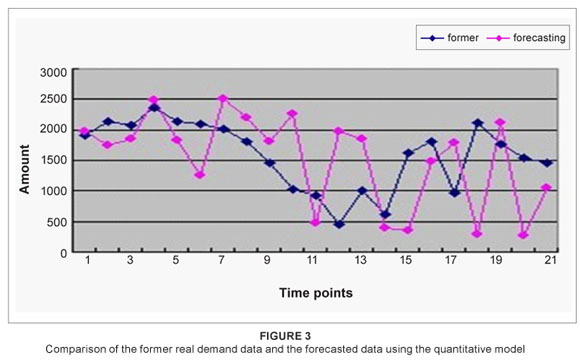 The difference between the data shown in Figure 2 and Figure 7 clearly shows that by adding the qualitative forecasting method to the quantitative forecasting method, the results are more accurate than when based on the quantitative method alone. However, the qualitative forecasting method alone cannot be used to express accurate demand. 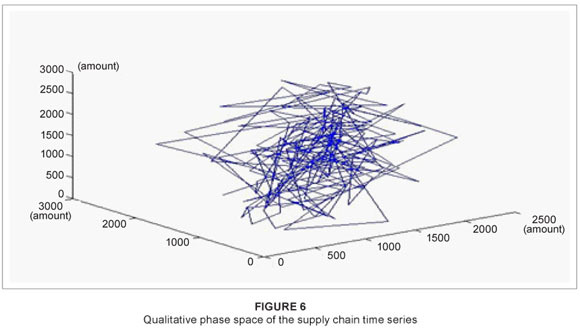 In this paper, we apply the qualitative phase space method combined with quantitative forecasting to forecast the product demand of a SC. There are many factors that influence the demand, some of them have a positive effect while some are negative. The market demand QD can be determined by two or more factors. Firstly, we apply the max Lyapunov exponent forecasting method to forecast demand. Secondly, we consider the factors influencing the demand, according to qualitative information and the results change accordingly. We thus obtain the difference between these two forecasting methods. However, the qualitative forecasting method does not provide quantitative demand data, as does the quantitative forecasting method. As introduced before, QD = QD (1+K) and the most important thing is to decide the parameter K in this function. In order to get more reasonable and accurate forecasting demand data, we can combine other methods to analyse time series. Zhuo et al.9 proposed a model of temporal pattern discovery from multiple time series based on temporal logic. Wyatt et al.19 applied a simple dynamic model of interacting markets for housing and mortgages. Lin et al.20 studied the effect of trust mechanisms on SC performance and found that the trust mechanism can reduce average cycle time and increase the in-time order-fulfilment rate in certain market environments at the expense of the material cost. There is a well-known and much researched problem regarding SC inventory: the bullwhip effect. Lee et al.21 identified four major causes of the bullwhip effect. Miragliotta22 introduced conflicting approaches between academics and managers to describe and analyse this phenomenon. Furthermore, the model predictive control23 has been applied in SC problems coping with intractability in optimal closed-loop feedback control decision. In this paper, we considered a very simple SC system, containing two levels, so the bullwhip effect problem was easier to approach than the former models. However, many other analytical methods can cope with time series data mining. The next task is therefore to find a good way to decrease the bullwhip effect and improve the forecasting accuracy to further improve SC performance.